The setting sun is just about to dip behind the Specimen Mountain and leave Longs Peak and the Rock Cut in darkness for the evening. Just before the sun does that however, a beautiful red glow showers Longs Peak and the Rock Cut with soft evening light of the setting sun. Viewing sunset from the Rock Cut and Trail Ridge Road is an awesome experience to have when at Rocky Mountain National Park. The view from the Rock Cut at over 12,000 ft above sea level makes for some of the most impressive view of Longs Peak and Forest Canyon. 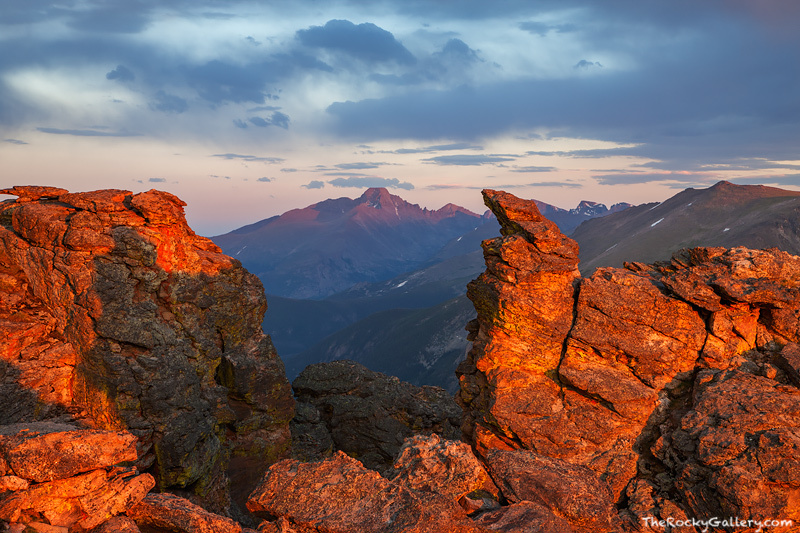 Longs Peak being Rocky Mountain National Park's highest peak will turn a brilliant red right before the sun sets. Photo © copyright by Thomas Mangan.